Here is a report from the Progressive State Network titled, "Increasing-Democracy,"
The Texas legislature only meets once every two years, and this year there was enough drama, both real and fabricated, to last until they reconvene in 2011. The biggest story by the end of the session was the minority parties ability to kill voter ID legislation in the House by "chubbing" or running out the clock by meticulously debating non-controversial legislation. The need to prevent the disenfranchising ID bill has the unfortunate consequence of killing much good legislation. And the primary reason there was good legislation to pass in the House was the big intrigue from the beginning of the session - the election of a compromise speaker with minority party support, replacing long-time speaker and conservative stalwart Tom Craddick. Fabricated drama came primarily came from the governor, who spent much of the session ginning up anti-government fervor with attempts to reject recovery act funding, complete with pandering statements about seceding from the Union. Like other GOP presidential hopefuls, he blustered about not wanting the money while lawmakers admitted that without the help the state's budget would have been a mess. The other item that the governor and conservatives used to distract the public was another push for voter ID supported by false, and often racist, claims of voter fraud. The final big drama of the legislative session was the need to come back for two special sessions because the voter ID fight in the House had left some executive agencies without authorization to conduct business. In the end essential legislation on the agencies and a few other matters were passed relatively quickly. Budget and Stimulus: The state is slated to receive over $16 billion over two years in recovery act funds, and passed a two-year budget of over $180 billion. And while recovery act money has prevented draconian cuts in essential services such as education, and fueled rapid spending on transportation infrastructure, Governor Perry has used the stimulus as a political football, making a show of refusing hundreds of millions of dollars in unemployment insurance benefits for the people of his state. Lawmakers made concerted efforts to override the governor's decision, but were unable to get a bill to force the issue out of both houses. Using the recovery funds, the state pass a balanced budget, while being unwilling to tap the state's rainy-day fund of approximately $9 billion despite the economic crisis. At the same time, the fiscal gains from the reviled stimulus was also used to expand the franchise tax exemption to 40,000 additional small businesses with revenue of up to $1 million. Unfortunately, the state's business tax revenue is falling already and a structural deficit threatens to force severe budget cuts in the next biennium. Privatization: Private toll roads legislation died even as the governor personally pushed it to the very end of the special session. While Gov. Perry has aggressively pushed privatization, in roads and elsewhere, for many years, serious scandal and misuse of public money has gone hand in hand with this expansion and undercut support in the legislature. endorsement of the lieutenant governor. And, importantly, none of the anti-choice bills put forth by conservatives were successful, including an ultrasound bill that was pushed strongly. Primary and Secondary Education: Teachers will see a one-time pay raise of $800 under the spending plan for recovery act dollars, and school districts are getting another $2 billion in funding. This increase is not, however, sufficient to cover shortfalls built up after several years without an increase. The legislature also passed a revision of the student accountability standards that retains the mandate that students pass standardized tests to advance to the next grade, but reduces the emphasis on the much-derided Texas Assessment of Knowledge and Skills, as well as some other requirements such as the number of mandatory courses. Higher Education: Texas is currently a lagger in its number of tier one research universities. Newly passed legislation creates funding pools and incentives for emerging research universities to advance to nationally recognized tier one schools. The guaranteed admission that the top 10 percent of state high school graduates to state colleges is being scaled back with colleges now required to give only three quarters of students based automatic admission. The law will primarily affect Univ. of Texas' main campus, which projects that 86 percent of its fall 2009 freshman class will be admitted automatically because they were in the top 10 percent of their high school class. HB1937 allows local taxing authorities to offer financing for renewable energy installations with payment to be made through an add-on to the owner's property taxes. HB 1935, a workforce training bill, creates a green jobs training and development program that includes funding through a grant program. HB 432 promotes low emissions and plug-in hybrid vehicles for fleets of major State Agencies. Criminal Justice: Generally Texas has been moving in a more progressive direction on criminal justice policies in the past few year, that trend continued at a measured pace this session. Death Penalty: A statewide capital defense office is being created, here, in the capital of capital punishment. This long-overdue reform will help resolve the egregious instances of incompetent counsel that have plagued capital defendants in the state for years. Dedicated capital defenders are essential to ensuring basic fairness for those facing a possible death sentence and defendants in Texas will clearly benefit from this change. Human Trafficking: The victims of human traffickers now are able to sue and seek punitive damages from the traffickers and the organizations involved. Additionally, a task force was established to come up with policies for preventing and prosecuting human trafficking. Guns: Both of the gun lobby's "right to carry" bills failed to pass. The most notorious would require colleges to allow concealed handguns on campus; the other would have required that employers allow workers to store guns in their parked vehicles outside of work. hundreds of worthy bills didn't get a vote. Hopefully they will get the message that the right to vote is fundamental to our freedom and prosperity and committed advocates within and outside the legislature will continue to fight to preserve it. On another note, there was a solid election integrity bill passed into law that institutes common sense procedures for handling and testing electronic voting machines. standards and hiding the need for additional efforts and supports." of the Hispanic community,” said Ramiro Cavazos, President of the SAHCC. how our youth are faring in our public schools." CARROLTON – Gov. Rick Perry today ceremonially signed House Bill (HB) 3, which will improve public education and strengthen the state’s public school accountability system by holding schools accountable for graduating students who are college and career-ready, ensuring that schools retain rigorous high school graduation plans, improving parent access to student academic information and increasing school district financial transparency. The NYTimes editors just came out with this. The concern that is not addressed that is shared by most reformers is the standardization and the testing that follows reforms that our laid out in this manner. A focus on high-quality teachers is excellent though. The federal government talks tough about requiring the states to improve schools in exchange for education aid. Then it caves in to political pressure and rewards mediocrity when it’s time to enforce the bargain. As a result, the country has yet to achieve many of the desperately needed reforms laid out in the No Child Left Behind Act of 2002 and other laws dating back to the 1990’s. Education Secretary Arne Duncan is ready to break with that tradition as he prepares to distribute the $4.3 billion discretionary pot of money known as the Race to the Top Fund. States that have dragged their feet or actively resisted school reform in the past are screaming about the rigorous but as yet preliminary criteria by which their grant applications will be judged. President Obama gave fair notice of this shift in a speech earlier this year, when he talked about pressuring the states to do better by the country’s 50 million schoolchildren. But Mr. Duncan will need cover from the White House to weather the storm. The long and detailed list of criteria just released by the administration includes a fine-grained evaluation process under which states get points for reforms they have made and points for changes they promise to make — and conditional funding that can be revoked if they don’t make them. The process finally allows the federal government to reward states that have made progress and to bypass slackers. The president and the secretary are rightly interested in replacing a wild patchwork of standards with coherent common standards and tests that would allow parents to compare their schools with others. The government cannot and should not write those standards. But states that have committed to joining, say, the standards consortium started by the National Governors Association will be favored in the funding competition over states that have not. More consideration will eventually be given to states that develop plans for adopting internationally benchmarked K-through-12 standards that build toward college and career readiness. Similarly, the process requires states to develop systems that evaluate teacher performance, taking student achievement into account. States must also be required to make sure that poor and minority students finally get a fair share of high-quality teachers. But that requirement will be meaningful only if the states are forced to develop serious teacher-quality measures. In general, the plan needs to be clearer about what states must do for long-neglected minority students. But over all, it marks an important step forward in the federal stance on education. Coalition of business, civil rights groups calls for transparency in school accountability. Many Texas public schools are expected to show big gains when accountability ratings are released Friday, but a disparate group of critics says the improvements could be illusory. For the first time, schools will be able to count as passing students who fail any section of the Texas Assessment of Knowledge and Skills but are on track to pass in the future. The new measure, which has been approved by the U.S. Department of Education, is seen as a way to gauge how well schools are helping low-performing students catch up to their classmates. The Texas Education Agency uses a mathematical model based on a student's test score and the school's average scores to determine if the student is projected to pass. Schools were being punished for having students arrive at their doors ill-prepared, said Julian Vasquez Heilig, a University of Texas education professor. So this measure will provide a truer picture of how effectively a school moves students forward, even if they miss the passing standard, Vasquez Heilig said. But early indications are that the new measure will also help a large number of schools climb up the four-tiered accountability ratings scale and claim success. In the Dallas school district, for instance, one-third of the campuses will benefit from the new measure, according to newspaper reports. The Austin district has not released its preliminary test results. "You're going to have a lot of school districts and a lot of campuses that are going to be given substantial upgrades, but their actual performance won't have changed," said Bill Hammond, president of the Texas Association of Business, a trade group for Texas employers that has pushed schools to better prepare students for the workplace. Frances Deviney of the Center for Public Policy Priorities, an advocacy group for low-income Texans, said the concern is that "masking the true number of kids still struggling to meet the state's academic standards" will undermine the public and political support for programs that help those students. The business group has joined with the center and some other "nontraditional friends," as Hammond put it, to highlight the need for transparency in school accountability reporting and strengthening standards. Those two organizations have rarely seen eye to eye on key tax and spending issues that affect education. Other members of the coalition, which will hold a news conference today to air its concerns, include the Mexican American Legal Defense and Educational Fund, the San Antonio Hispanic Chamber of Commerce and the League of United Latin American Citizens. They joined forces with the business association in 2007 to speak out on immigration issues. Angel Abitua, the local LULAC district director, said his organization has jumped into this issue because the dropout rate is "horrendous" for Hispanic students and the state needs to be forthright about that problem for it to be addressed. Hispanic students in Texas drop out of school at three times the rate of their white peers, according to the latest state figures. "We don't want it to be hidden from sight for political expediency," Abitua said. Not sure how much press this got but I think that Jimmy Carter's decision to sever my ties with the Southern Baptist Convention should be looked at closely. This is surely making waves and in a good way, I hope. A few weeks after wrapping up their budgets for the new fiscal year, lawmakers in some states already expect a new round of spending cuts, including to higher education, as tax revenues continue to fall. Estimates of states' revenue shortfalls have grown worse since the spring, reaching a total of nearly $143-billion when most states began the 2010 fiscal year, on July 1, according to a survey by the National Conference of State Legislatures. But at least 11 states are already expecting to make midyear cuts, totaling more than $22-billion, according to the Center on Budget and Policy Priorities, an advocacy group. Why Are We Pursuing the Wrong Set of National Standards? With $100 billion to spend in the next two years, the Obama administration means business when it talks about reshaping the public education system. Why, then, is it ignoring some of the business community's best insights when it comes to core questions of how to spark systems change? There's a disconnect between what the administration is promising - a set of voluntary national content standards - and what we the people will receive - a standardization of the public school system. As U.S. Secretary of Education Arne Duncan has explained, the Obama administration's top priority is to "make sure our K-12 students are prepared to succeed in college and the workforce." As a first step toward achieving that goal, Duncan wants states to adopt "rigorous K-12 standards that prepare students for success in college and the workforce." Almost every state has agreed to participate - an unprecedented step toward a uniform definition of success in American schools. At first blush, it's an optimal way to remedy the ongoing injustice that some children receive a high-quality public education, while others barely achieve proficiency. But here's the problem: although the public school system needs greater quality control, content standards are not the optimal measure to pursue. If our goal is to "prepare students to succeed in college and the workplace," the standards we pursue should be whatever young people need most to be successful in college and the workplace. And in today's world, although young graduates certainly need a foundation of content knowledge, the greater measure of their long-term success will be the extent to which they learn to use their minds well. Using one's mind well means more than just acquiring large numbers of discrete facts; it means learning how to find, analyze, and use information in adaptive ways. It doesn't mean content doesn't matter, either - just that our decisions about which content to teach (and why) should be made at the school level, by the people who know students best - their teachers. Neither does it mean we should throw up our hands and say there are certain things we just can't measure. In one school, for example, the curriculum is organized around seventeen standards of intellect, and the school has figured out how to measure factors as elusive as "collaboration" and "quality work." The purpose of a national set of standards must be to ensure that a school in California and a school in Mississippi are reaching for the same golden ring. The standards must be aspirational, not basic. They must be guideposts, not hitching posts. And they must be indicators of wisdom that students will need to be successful in college and the workplace, not shards of knowledge that make it easier to devise uniform tests and mandate standardized modes of instruction. Numerous experts share this concern. As Harvard Business School professor Clayton Christensen has observed, "there are powerful economic forces in place to standardize both instruction and assessment despite what we know to be true - students learn in different ways. The question now facing schools is this: Can the (current) system of schooling designed to process groups of students in standardized ways in a monolithic instructional mode be adapted to handle differences in the way individual brains are wired for learning?" Princeton economist Allan Blinder echoes a similar note of caution. "It is clear that the U.S. and other rich nations will have to transform their educational systems so as to produce workers for the jobs that will actually exist in their societies. Simply providing more education is probably a good thing on balance, especially if a more educated labor force is a more flexible labor force that can cope more readily with non-routine tasks and occupational change. But it is far from a panacea. In the future, how we educate our children may prove to be more important than how much we educate them." We desperately want to believe it is possible to find simple solutions to the complex problems we face, and to neatly divide cause and effect. To improve student learning, the conventional wisdom goes, we must make schools (and teachers) more accountable to student test scores. As Secretary Duncan said recently in remarks at the Governors Education Symposium: "Once new (content) standards are set and adopted, you need to create new tests that measure whether students are meeting those standards." Duncan has pledged up to $350 million to "help pay for the costs of developing those tests." I believe the Secretary genuinely believes this path will best serve the needs of all children. I believe just as strongly that it will not. So how do we take this knowledge and create a more effective intervention strategy for our public school system? Let's start by remembering that in any organization - whether it's a school, a business or the entire public school system - the central challenge is to strike the right balance between individual freedom and group structure. Artful leaders allow enough individual freedom so individuals have the room to be innovative, adaptive, and empowered, and they provide enough structure so all people have the support and clarity they need to do their best work. Apply that thinking to our current challenges, and a good rule of thumb emerges for the Secretary to follow: First, provide simple structures that clarify for all schools what we mean when we say we want children to learn to use their minds well. And second, provide educators with the freedom to make complex decisions about which content will help them grab the golden ring and truly prepare our children for success in college and the workplace. plateaus in test score trends in the 16 states analyzed, they were not as pervasive as may be commonly assumed. Percentage proficient trends followed a wide variety of trajectories, including some plateau patterns. Of the 55 trend lines we examined from various states and different grade levels in reading and math, 15 exhibited a plateau pattern. We also found 21 trend lines with steady increases in the percentage proficient over time and 19 more with fluctuating “zigzag” patterns that still moved in an overall upward direction. • The largest gains did not consistently show up in the early years of a testing program. In many of the trend lines, the largest gains occurred between the first and second years of administering a new test. But just as often, the largest gains appeared between the third and fourth years, or between the fifth and sixth. Thus, we concluded that the largest gains are just as likely—and sometimes more likely—to occur after four or even six years of a testing program as they are in the first few years. of NCLB were not always concurrent with the first few years of a state testing program. In several states, the tests used for NCLB had already been in place for some years, and a bump in scores still appeared after NCLB. This pattern suggests that test results can increase substantially even after a test has been in place for several years if higher stakes are introduced in the accountability system. • In the three states with the longest trend lines, gains generally did level off after nine or ten years, but the data were too limited to know whether this is a consistent pattern in state test performance. One complicating factor in studying test score trends is that states tend to change their tests quite frequently, so long trend lines are rare. It may well be that by the time a state would start to show a plateau effect, it changes its tests. This post by Professor Stephen Krashen is in response to the previous post. Here are his comments, posted on this website. investing so much time and money on standards and tests? priority of the administration is new standards and tests. the Council’s response will be to these national standards. always keep the needs of teachers and students first. she did not represent NCTE in that capacity. through democratic processes by NCTE members. standards through the lens of NCTE policy. offer to provide a review. of standards are best left to teachers. How will the University of California survive? The impact of the economic crisis on the University of California has been in the headlines over the last two weeks. Last Saturday's Union Tribune article on the UC budget meltdown drew heavily on a letter that was signed by 23 department chairmen at UC San Diego. Unfortunately, this has been the only public proposal from UCSD faculty and so all of us who teach there have been tainted with its self-serving recommendations. Although the tone of sociology professor Andy Scull's original letter gave the impression that he was contesting the current UC regime, in many ways the logic of what he proposed coincided perfectly with where the UC was heading long before the economic crisis. Professor Scull and the other department chairs who signed his letter urged UC President Yudof and the regents to consider "closing campuses and enrolling more out-of-state students, who pay much higher tuition, to minimize long-term damage to the UC's more accomplished campuses." As the privatization of the UC continues (UCSD, for example, is a public university in name only with only 6% of its budget coming from the state), more out-of-state and international students will be admitted. This has been a shift desired by some for several years now. The mission of the UC that says we should be serving the people of California is sacrificed on the altar of revenue flow. UCSD then becomes a finishing school for out-of-state students from rich families and affluent foreigners. The University of Michigan, now almost fully privatized and being talked about as a model for the new UC, currently enrolls more international students than Mexican American students. Once the three "elite" UC campuses make the transition to being in essence private schools, working class and minority students will slowly disappear from their classrooms. Again, this is already happening due to increased tuition (which Scull supports) and enrollment caps. But if UC were to adopt Scull's plan and wipe out the campuses with the most underrepresented students-Riverside and Merced-you accelerate the process. Of course, this has already happened at the professional schools where Blacks and Chicanos can be counted on one hand. In Scull's scenario, by 2040 when Latinos make up a majority of the state not just the professional schools but the entire UC will be closed to all but a handful of them (although large numbers of them will be academically qualified). Talented 2%, anyone? It will be argued that wealthy out-of-state and foreign students paying higher fees will subsidize financial aid for less affluent students. But this positive scenario depends on the kind of successful outreach to working families that has never been the norm at UCSD. The one area where UCSD has made progress in terms of enrolling more Chicano and Black students has been community college transfers. A likely outcome of the crisis is that foreign transfers begin to displace local transfers. The percentage of foreign students among transfers is already higher than it is among new freshmen. The twin elephants in the budget crisis room that UC administrators and faculty have chosen to ignore are class and race privilege. In the case of UC San Diego, it's in the institutional DNA. When campus founder Roger Revelle first imagined a La Jolla campus in the late 1950s, he saw it as an exclusive "seedbed for future leaders." The unwashed masses, he implied, could attend San Diego State. The reaction in the central valley to the now infamous letter from the UCSD 23 was rightfully angry and to the point. The Fresno Bee's Bill McEwen put forth one of the better analyses: "So, faced with the challenge of making do with less - as millions of Californians are doing - what did some of the purportedly best and brightest at UC San Diego come up with? Close down the newest UC serving some of the poorest towns in America, a region where thousands of bright, industrious youngsters are working to someday become the first college graduates in their families. I've got a better idea. That campus they've got down there in tony La Jolla, where some two-bedroom condos - I kid you not - list for $2 million? Shutter the university, sell everything off and start all over in Brawley." Or maybe Chula Vista. Although late last week UC President Yudof rejected the idea of closing campuses, it is important to understand the logic behind what the UCSD 23 suggested-a "disaster capitalism" solution in which the crisis allows those at the top to maintain their privilege, facilitates privatization, and further fetishizes the notion of "excellence." Elite sectors of each campus will become more exclusive as rich, i.e., externally funded, departments turn into gated communities surrounded by the mini-ghettos of under funded programs that are unable to generate their own revenue. It's curious to see that so many department chairs at UCSD whose own programs could be negatively affected signed on to the letter, e.g. History, Communication. If the crisis continues for two or three more years, as some predict, smaller programs like African American and Chicano/Latino studies will no doubt shrink and may eventually disappear. Big-time donors willing to drop a million dollars on academic programs designed to question economic and cultural injustice simply don't exist. Is there a way out of the crisis for the UC? President Yudof's contention that if the university could only explain to the people of California how much the UC does for them they would rally to its defense founders on the shoals of powerful stereotypes about "lazy 'radical' professors." If this crisis does nothing else, it hopefully will destroy once and for all the fantasy that "Marxist professors" are running the University of California. The UC is a giant corporation replete with over-paid executives, a cadre of increasingly entrepreneurial and hyper-professionalized faculty, and an army of over-worked staff and instructors. Milton Friedman would approve; Marx most certainly would not. On Wednesday, the UC Regents rubber stamped a furlough/pay cut for faculty and staff. Only Lt. Gov. John Garamendi voted against it. Unless the Regents and elected officials come up with new ways for the state to support higher education, the UC system will continue its decline. The Cal State campuses will follow close behind. Who will be the real losers in all of this?-the hopes and dreams of generations of future working and middle class California students. Jorge Mariscal is director of the Chicano-Latino Arts and Humanities Program at the University of California, San Diego. Who Will Educate the Next Generation of California Youth? Higher Education in California is facing the greatest challenge in its history. But Latino youth will pay a disproportionate share of the consequences for the crisis in the next few years. The impasse between Governor Schwarz-enegger and the state legislature have created the conditions for an ever further worsening of the economy of this state. The cut in $584 million in the budget of the California State University system has led Chancellor Charles B. Reed, to inform that the 23 institutions that make up the CSU, will accept 10,0000 less students this Fall 2009 term. Also a few days ago he announced that there will be no admissions in any of the 23 universities for the Spring 2010 semester/quarter. This will mean that a total of 45,000 California students will be left without choices for a four-year institution. That is, unless they come from families with the resources to pay for a private college education. > The chancellor also announced that employees, both faculty and staff, will be asked to accept furloughs to reduce the $584 million in budget cutbacks the system will face this next fiscal year. Even if there are furloughs faculty and staff are also likely to suffer layoffs. The quality of education could likely suffer impacting how many students per faculty, how much time faculty has to provide mentoring and research. In addition, entering students will experience a 10 per cent increase in tuition this year. It seems also likely that in the July 21 meeting of the CSU Board of Trustees an additional 20 per cent raise in tuition will be approved. Cumulatively, this will mean a 32 per cent rise in tuition costs for CSU students. The CSU system, with its 433,000 students is the second largest higher education system in the state. The other two, the University of California, with 220,000 students and the California Community Colleges (CCC) with 1,548,000 constitute the three-tiered system of higher education in this state. However, it is the CSU who makes the largest contribution to the education of Latinos in the state. Only 3 per cent of UC students are Latinos while Latinos make-up 8 per cent of the 433,000 CSU students. While the CCC has a larger percentage of Latino students, the community colleges do not offer a bachelor which is required in most professions. Therefore, the larger burden of educating the next professional Latino generation rests on the shoulders of the CSU. These dramatic budget cuts come at a time when studies suggest that by 2025 close to two in five jobs (41 per cent) will require a university degree. This lack of access at a time when, according to Deborah Santiago 2006 study supported from the Tomas Rivera Public Policy Institute, the percentage of Latinos earning a bachelor has not changed significantly in the last 25 years. The percentage has hovered between eight and 10 per cent. These cuts will significantly make these numbers decline even further. Ironically, the restriction in access to higher education for California youth comes at a time when by 2025, 41 per cent of the jobs will require a bachelor. Given that the "baby boomer" generation will be retiring in a few years and that they tend to have the highest level of education, we will be facing a gap between supply and demand. According to Hans Johnson and Ria Sengupta (2009), the state will need one million more college graduates than what the system of higher education provides. These cuts will increase the gap between supply and demand and will reduce this state's ability to compete in an increasingly competitive world. The lack of an educated workforce, which by 2020 will be 50 percent Latino, will impact the social security and pension systems which many of the "baby boomers" will be counting on for their economic survival. If Latino youth is not educated, it will affect us all, regardless of national origin, ethnicity or race. The CSU, according to the Blue Sky Consulting Group (April 2008) contributes to the support of 207,000 jobs and the circulation of $13.6 billions through the state's economy. This does not include the thousands of faculty, staff and administrators employed on the 23 universities. So in addition to the educational effects the economic effects will be immediate and substantial. We have to invest in the future now, and it is our responsibility to tell Sacramento what we need for ourselves and the future of this state. A briefing book detailing legislation passed during the 81st session of the Texas Legislature is now available. About 100 bills impacting public education were approved by lawmakers during their 2009 session. The link to this pdf document ishttp://www.tea.state.tx.us/WorkArea/linkit.aspx?LinkIdentifier=id&ItemID=5103 . There is now a House Bill 3 Graduation Requirements webpage. This page includes a link to the enrolled version of the bill, the first FAQ document and a side by side document. Related information will be added to the page as it becomes available. The URL ishttp://ritter.tea.state.tx.us/curriculum/HB3index.html . Updates have been made to the 2009-2010 Testing Calendar. The U.S. secretary of education’s call to “turn around” the nation’s 5,000 worst-performing schools has found a warm welcome among educators and policymakers who see that focus as long overdue. But it has also sparked debate about how—and whether—such an enormous leadership and management challenge can be accomplished. We are excited about the response to date for the upcoming First Triennial Conference on Latino Education and Immigrant Integration, Oct. 26-28, 2009. This conference, hosted by the University of Georgia's Center for Latino Achievement and Success in Education (CLASE) in collaboration with the National Latino Education Research Agenda Project, will provide an important venue for research, policy and information regarding immigrants and education, particularly in the rapidly changing southeast. See our website at http://www.coe.uga.edu/clase/conference/index.htm for more information about keynotes, submissions and registration. In order to accommodate additional presentation proposals, the call for presentations has now been extended through September 30. (Note, however, that early registration ends September 15th, and that later submissions may not be listed in all published program materials due to publishing deadlines.) Submissions which have been received to date have been sent out for review and confirmations are expected in August. Finally, we'd like to request your help in sharing this information broadly with colleagues, list-serves, online calendars of events, etc. so please feel free to distribute to others. (If you'd like paper copies of any of this information to share, please contact us at claseuga@uga.edu.) Again, the conference website is http://www.coe.uga.edu/clase/conference/index.htm. Don't let ideologues more interested in wedge politics than in educating Texas kids hijack our language instruction programs for political ends. The fact is that not even immigrants dispute that English is necessary. And if learning other languages were so easy, wouldn't many more Americans be, at least, bilingual? The real issue is that many children — most, U.S. citizens — start school without the English proficiency needed to succeed at their grade level. I recently recalled that my parents didn't speak English to me until a few months before I started school to give me a solid foundation in Spanish, upon which I could build my English. So, by the fall, I could answer most questions that a first-grader would be asked in English. But like all other Spanish-speaking kids in Robstown, I was sent to “low first grade,” where most kids spent a year trying to learn English from teachers who spoke no Spanish. Then, they would go to “high first grade” for another year, so by year three, they were a year behind their age-mates. Luckily, my limited English — and my parents' daily counseling — got me promoted in three days. But even in high first grade, 7-year-olds were routinely disciplined for communicating in the only language they really knew. Texas finally got bilingual education in 1974, but only as a more humane way to teach English — using the child's first tongue. Language instruction has developed immensely since then, and its results have been closely studied. But xenophobes are playing on fears to get bilingual instruction replaced with English-immersion programs. Iliana Alanis left banking to become a bilingual teacher and, after earning a Ph.D., got a faculty job at UTSA's graduate school. “It was just something I wanted to do,” she says. She also notes that in Texas, bilingual education varies widely. Some schools teach English using children's first tongue for one year, others for five; and some incorporate “one-way” and “two-way bilingual models” in which English-speakers learn Spanish and Spanish-speakers learn English. All of these methods have been evaluated closely. The most extensive of these assessments were conducted by George Mason University researchers who tracked 210,054 students. They clearly concluded, Alanis points out, that students given dual-language, two-way instruction over five years performed best over the long term. And it is easy to see why. “When you have the two (language) groups together, they learn from each other and they model for each other because children learn a language to interact with other children,” she says. “And for them, it's a pretty safe place because they're talking to each other and they don't worry about making mistakes.” Or being ostracized. The extent to which schools track and Latino/a youth should concern us all. It's important to be critical of conversations surrounding the issue of college OR workforce readiness standards. 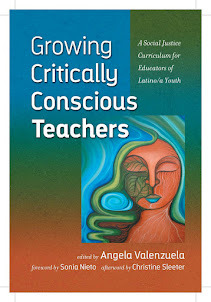 There's a long history of education reform efforts using curricular tracking methods to funnel Latino/a children in two direction, and many times these practices are informed by school's perception of students as mentioned in this article. I'm anxious to see if and how the possible appointment of Thelma Melendez de Santa Ana will help in addressing Latino/a, and more specifically ELL students' needs. When Richard Gomez was young, his father discouraged him from going to college. "My dad was saying, 'No, you're the oldest of eight. You need to graduate and go to work,'" Gomez said. But Gomez, now coordinator for educational equity at the State Office of Education, went to college anyway after a counselor told him he was "college material." It's the type of encouragement Gomez said is essential to keeping Latino students -- who might not otherwise envision the same futures as their white peers -- in school. Experts say a number of systemic and personal challenges keep many Latino students from graduating. Some face economic pressures such as having to work -- or wanting to drop out of school -- to help support their families. Others struggle to fulfill high school requirements in a language they're still learning. Some students who are in the U.S. illegally --- about 7 percent of Latinos younger than 18 -- see no point in finishing school, knowing it will be difficult to secure scholarships and professional jobs, experts say. Others have parents who didn't graduate and can't prepare them for college the same way other parents might, said Patricia Dark of the Utah Hispanic Chamber of Commerce. Still, Latino students as a group are diverse, yet they sometimes are tracked into lower-level classes based on the assumption they all struggle academically, Gomez said. "A lot of policies, practices and structures in place, some written and some not, have the overall effect of sending a clear message to kids of color that they're really not valued in our high schools," said Michael Wotorson of the Campaign for High School Equity, a Washington, D.C.-based coalition. 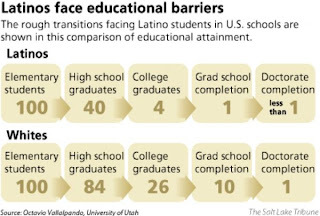 For example, Latino students comprised about 8 percent of Utah's Class of 2008, but made up only 5 percent of those who took Advanced Placement exams. East High junior Margarita Rodriguez said she was the only person of color in one of her honors classes. "You felt uncomfortable like you didn't belong," she said. "People just don't think you can do as much." Gomez said placing Latino students into lower-level classes is the type of inadvertent practice that makes some feel schools don't value them. Students who don't feel valued are more likely to drop out, said Theresa Martinez, assistant vice president for academic outreach at the University of Utah. "If they knew that ahead of them was a six-figure salary and they would be treated fairly, they would keep going to school," Martinez said. "But they don't see that." WASHINGTON -- Pell Grants are the federal government's largest direct grant to students with low family incomes. So it's no surprise that when Congress and administrations debate priorities for higher ed spending, the Pell Grant always is a hot topic. Does the program have enough money? Should it be an entitlement? Should it be protected from requirements that don't focus on financial need? A report released Tuesday by the National Center for Education Statistics details what is known about Pell Grant recipients by taking a close look at data from 1999-2000 bachelor's degree recipients, a group in which about 36 percent of people received at least one Pell Grant while in college. Generally, the report found that Pell Grant recipients are more likely than others to have "risk" characteristics (such as delaying postsecondary enrollment after high school graduation) that suggest statistically greater chances of dropping out of college. At the same time, the report found that when controlling for these and other factors (such as parents' educational levels), Pell Grant recipients graduate in shorter time frames than others. Here are demographics of Pell Grant recipients, showing them to be older on average, more likely to be female and first-generation college students and less likely to be white than those who don't receive the grants. In terms of specific risk factors that make it less likely a student will complete college, several are evident among Pell Grant recipients. More than 11 percent of them are single parents, compared to 4 percent of non-Pell recipients. Just under 60 percent are financially independent of their parents, compared to about one-third of other students. And more than 33 percent delayed enrolling in college after finishing high school, compared to 23 percent of other students. Despite those risk factors, academic achievement, as measured by grades in the major, was only slightly lower for Pell Grant recipients. AT THE age of 34, Julian Castro has pulled off a remarkable feat. On May 9th, without even the need for a run-off, the polished young lawyer won the race to become mayor of San Antonio, the largest Hispanic-majority city in America and the seventh-biggest city in the entire country. He joins Antonio Villaraigosa, the mayor of Los Angeles, as one of America’s half-dozen most prominent Hispanics. You only need to tour the Rio Grande valley, which stretches from Brownsville in the east up almost as far as Laredo, to see what he means. The valley includes some of Texas’s fastest-growing and most successful counties, such as Cameron County around Brownsville and Hidalgo County around McAllen; Brownsville has boomed, thanks in large part to its port, which serves Mexico’s buoyant north. McAllen has also become a favoured place for rich Mexicans to buy homes, educate their children and squirrel their money away; its mayor, the engagingly town-proud Richard Cortes, has big plans for an arts district, upmarket shopping centres, a huge public library which he says will be the fifth-largest in the country, and much else. But you can also encounter poverty on a scale hard to find anywhere else in America. More than 30% of the valley’s population still falls beneath America’s official poverty level, according to Sister Maria Sanchez of Valley Interfaith, a local charity. The poorest among them are to be found in the colonias, small settlements outside recognised towns. There are around 2,300 colonias in total, and the worst of them still have large numbers of houses without running water. In recent years state money has hugely improved some of them, such as Las Milpas, outside McAllen. Others, like Los Altos outside Laredo, are a national disgrace. “We are the richest country in the world, and we still have this,” says Jaime Arispe, of the Laredo Office of Border Affairs, as he surveys a street that looks as if it could be in Port-au-Prince. Others echo Mr Martinez Fischer’s views, if not quite the passion with which he expresses them. Rafael Anchia, another House member, was recently tipped by Texas Monthly as the first Hispanic governor of Texas—though not until 2018. He brushes the accolade aside, but like Mr Martinez Fischer says that the state has systematically underfunded public education and insists this will have to change. Health care is another racial issue. Texas has the worst insurance-coverage rates in America, and Hispanics, as well as blacks, fare much worse than Anglos; most Americans get their health care through their companies, but Hispanics and blacks are more likely to work for employers who provide limited benefits or none, or to be unemployed. The flaws in the American health system are mostly a federal matter, but Texas makes them worse by failing to take up available federal dollars because of the need for co-finance by the recipient state; by providing few public clinics; and by refusing to reimburse private hospitals for the cost of emergency care for people who cannot afford to pay, forcing them to jack up prices for others. It also operates one of the least generous subsidy regimes for poor children in the country. The reason why MALC will have to be listened to on all these counts is demographic. The Hispanic population is constantly being reinforced by the arrival of immigrants from across the Rio Grande, though economic, political and security pressures have started to make the border less permeable. But international migration is not the main driver of Texas’s booming population. Texas’s Hispanics, on average, are younger than the Anglos, and their women have more babies. In 2007 just over 50% of the babies in Texas were born to Latinas, even though Hispanics make up only 38% of the population. Over the eight years to 2008, reckons Karl Eschbach, Texas’s official state demographer, natural increase (which favours Hispanics) accounted for just over half the 3.5m increase in the state’s population, and migration from other states for almost half of the rest. Nor is it only Texas that is undergoing profound demographic shifts, says Mr Klineberg. Texas today is what all of America will look like tomorrow. At the moment there are only four “minority-majority” states (that is, states where non-Hispanic whites, or Anglos, are in the minority): California, Texas, Hawaii and New Mexico. He expects the 2010 census to show as many as 10-12 states to have passed that milestone; by 2040, he thinks, America itself will be a minority-majority nation. The geographical spread of Texas’s Hispanic population has changed in a way that will change the state’s politics. Most Latinos used to live south of the I-10, the motorway that joins San Antonio to Houston, notes Mr Anchia. But now Dallas, like Houston, has considerably more Hispanics than Anglos: a little over 40% of the population against around 30%. Mr Anchia himself represents a district that includes part of Dallas and a swathe of prosperous suburbs, including some where there have been nasty rows about illegal immigration. That might be easier than it sounds. Texas has proved far better than the other border states (California, New Mexico and Arizona) at adapting to the new, peaceful reconquista. In California, Proposition 187, which cracked down hard on illegal immigration, was heartily backed by the then Republican governor and passed in a referendum in 1994, though it was later struck down by a federal court. This kind of thing has only ever been attempted in Texas at local level, and even then only very rarely. Texas has always been a strong supporter of immigration reform that would offer illegal immigrants (of whom Texas has close to 2m, about 7% of its population) a path to citizenship. It has also always favoured NAFTA. Perhaps that is because Texas was itself Mexican until 1836. For centuries the border, demarcated by the Rio Grande, was entirely porous, and its very length meant that much of Texas felt joined to Mexico—a cultural affinity evidenced in the fact that the margarita and the fajita were both invented in Texas. Only recently, at the behest of distant authorities in Washington, DC, has this sense of propinquity seemed to weaken. Driven by anger elsewhere in America, immigration officials raid businesses looking for workers with false Social-Security numbers. Driven by post-2001 fears, the number of Border Patrol officers is being increased from 6,000 in 1996 to 20,000. Texans don’t like this much. In April Jeff Moseley, president and CEO of the Greater Houston Partnership, the city’s chamber of commerce, made a powerful speech to a Senate hearing in Washington in which he rebutted the notion that undocumented workers are a drain on America’s resources. According to a study he presented, they are more likely to be net contributors in fiscal terms. He argued that they mostly complement rather than compete with domestic workers, and that they are less likely to commit crimes than the native population. And he pointed out that cracking down on illegals has had a perverse effect, ending a pattern of seasonal or circular migration that has served Texas well for many decades. Instead, it has encouraged the use of people-smugglers bringing across whole families who then tend to stay. It has fenced people in, not out. Mr Moseley used the word “fence” calculatedly. Down in southern Texas there is no five-letter word more likely to provoke anger. The way Texans see it, the fence that is being built along a third of America’s 2,000-mile long southern border is an expensive waste of time. It sends an appalling signal to a friendly neighbour; it is easy to climb over, with or without a ladder; it is easy to circumvent; it is bad for the environment, because it cuts off animals from their water sources; and it tramples on the rights of landowners, since it has to be built well back from the riverside so as not to interfere with flood channels. But if the fence itself is likely to have little effect on illegal immigration, the fear of terror that gave rise to it, coupled with the recession on both sides of the border and Mexico’s murderous struggle with the drug lords in its border cities, are certainly affecting both the legal and the illegal sort of crossing. Everyone along the valley of the Rio Grande seems to believe that the border is slowly closing. The economy, too, is a powerful reason why people are crossing less often. The Mexican peso has fallen by 18% against the dollar since the beginning of 2008. That has hit retailers on the American side hard. Mexicans in the northern border provinces have been hurt by the collapse of America’s car industry. Many of the maquiladoras, factories set up just on the Mexican side of the border to benefit from lower wages and land costs, have specialised in making parts for Detroit. One of Texas’s main assets is a bit distressed just now. AUSTIN - The State Board of Education today gave final approval to new curriculum standards for about 190 Career and Technical Education (CTE) courses. The standards, called Texas Essential Knowledge and Skills (TEKS), update and streamline CTE courses offered in Texas public schools. In recent years, more than 600 CTE courses were available to be taught in Texas schools. The updated standards were written by teams of Texas secondary and postsecondary educators, business leaders and community members. • Transportation, Distribution, and Logistics. The board at a later date will determine whether some of the advanced CTE courses can count for a fourth mathematics or science course credit. This will potentially provide more course options to students in the Class of 2011 and subsequent classes who are required to earn four math and science credits as part of their diploma program. During this meeting, board members also learned that the Texas Legislature appropriated about $82 million less than was requested to purchase new English language arts and reading books. The board requested $547 million in funding for instructional materials that are to be used in classrooms beginning in the fall of 2010 but it received an appropriation of $465 million. Board members agreed that they would not delay the purchase of instructional materials for any subject or grade level. However, they did agree to about $44 million in cost cutting measures that include basing costs on 2008-2009 enrollment figures and reducing the textbook quota to 103 percent. The current quota is 105 percent, which means that for every 100 students, the district can order 105 textbooks. This allows a district to have extra materials on hand to replace lost textbooks or to provide materials to newly enrolled students. A 103 percent quota simply means that districts will have a smaller quantity of surplus materials on hand. A district could still order additional instructional materials at a later date if needed. Board members also asked Texas Education Agency staff to work with publishers to see if there were ways publishers could reduce the bid price of materials. The English language arts and literature books are currently scheduled to cost from $55.56 to $174.14 per book or kit, depending on the subject and grade. Board members asked staff members to calculate new maximum costs per textbook to achieve an additional $38 million in cost reductions to close the budget gap. As part of its efforts to manage the $19 billion Permanent School Fund, the board voted to hire NEPC, LLC to provide investment counsel services to the fund. The board also voted to rehire The Bank of New York Mellon to provide global custody and security lending services for the PSF. The board awarded a charter to Koinonia Community Learning Academy of Houston. The July meeting marked the board’s first meeting headed by new Chair Gail Lowe, R-Lampasas. Lowe was appointed chair of the board by Gov. Rick Perry on July 10. This is a great piece by Sen. Van de Putte. More of our state leaders should follow suit in speaking out on behalf of Texas children. In the past, the State Board of Education has fought a divisive culture war in establishing curriculum standards for Texas schools rather than engaging in honest, vigorous debate over the best way to prepare our students for the future. The 15-member board is charged with adopting policies and setting standards for Texas public schools, and it is currently preparing to adopt new social studies curriculum standards. These social studies standards will be in place for the next decade, and publishers will use them to create textbooks for sale in Texas and other states. The board recently appointed a panel of experts to help revise the social studies curriculum. The panel includes two "experts" whose experience is not in the field of education or curriculum standards, but in partisan politics. These panelists have decided to use our children's social studies curriculum as a platform for their political agendas and have advocated against the inclusion of cultural studies and diversity in the curriculum. Board members and their appointees have complained about an "overrepresentation of minorities" in the current social studies standards. For example, a lesson on citizenship calls for students to identify individuals who have modeled active participation in the democratic process, one such individual being César Chávez. They have voiced objections to the inclusion of Chávez as part of the lesson because they believe that Chávez is not a role model who "ought to be held up to our children as someone worthy of emulation." Chávez epitomizes a lesson in citizenship. Chávez fought to ensure Latino participation in the political process and for fair work conditions for all. The fact that his place in American history is disputable would surprise the students who attend the 44 schools across the country, including eight in Texas, named in his honor, as well the Texas and California legislators who voted to recognize César Chávez Day as state holidays. We should all be concerned when the contributions of Chávez or other minority figures to American democracy are cast aside and ridiculed. We should welcome the inclusion of all Americans who have helped to make this nation great. My concern over the recommendation of these panelists regarding the social studies curriculum is part of my larger concern over the current direction of the education board. Some board members continue to put their political agendas ahead of the needs of Texas schoolchildren. This must end. The social studies review panel will meet in Austin this month. The public will have a chance to weigh in at the public hearings as well as online after the initial recommendations have been posted. The final adoption of the updates is set for March, according to the Texas Education Agency. We cannot afford to politicize the education of an entire generation of Texas schoolchildren. Education is too important. Decisions of the board are key in shaping our classrooms, and they should not be made based on party affiliation. Our schoolchildren deserve better, and it is my hope that the recently appointed chairwoman of the board, Gail Lowe, will begin a transformation of the board from one entrenched in partisan warfare into one in which the only battle is to increase the quality of our public schools. Van de Putte, a Democrat, represents part of Bexar County in the Texas Senate and is a member of the Education Committee. The audio stream of the State Board of Education meetings is available on the Texas Education Agency Web site, www.tea.state.tx.us, by selecting the 'State Board of Education' heading. Beginning in September, Texans will be able to watch board hearings online. A briefing book detailing legislation passed during the 81st session of the Texas Legislature is now available. About 100 bills impacting public education were approved by lawmakers during their 2009 session. Our society needs a LOT of work and prayer! These hate- and racist-filled efforts really show how California, like the rest of the country, is still battling deeply entrenched racism. This should worry all of us. The measure would end public benefits to illegal residents, challenge the citizenship of their U.S.-born children, cut welfare payments to those children and impose new birth certificate requirements. In a stretch of desert just north of the U.S.-Mexico border, men and women in khakis and the colors of the American flag recently gathered at a border watch post they call Camp Vigilance and discussed their next offensive in the nation's immigration wars. The target: Illegal immigrants and their U.S.-born children who receive public benefits. The plan: a California ballot initiative that would end public benefits for illegal immigrants, cut off welfare payments for their children and impose new rules for birth certificates. "We will be out in full force to qualify this initiative," said Barbara Coe, who helped develop Proposition 187, the 1994 measure that would have ended benefits to illegal immigrants but was ruled unconstitutional. "Illegals and their children are costing the state billions of dollars. It's invasion by birth canal." Supporters of the initiative, recently unveiled by San Diego political activist Ted Hilton, hope to challenge the citizenship of children born in the United States to parents who are here illegally. The 14th Amendment states that "All persons born or naturalized in the United States, and subject to the jurisdiction thereof, are citizens of the United States and the State wherein they reside." Backers of the initiative argue that illegal residents are not "subject to the jurisdiction" of the United States and that, as a result, their U.S.-born children should not be citizens. Before Hilton, Coe and their allies can argue that point in court, however, they have many hurdles to overcome. Whether the initiative will even make it to the ballot remains to be seen. Organizers have just begun to collect the 488,000 voter signatures required to qualify the measure for the June 2010 election. So far, Hilton said, they have raised about $350,000 -- far short of the $4 million generally needed to pay signature gatherers to get a statewide initiative over that hurdle. But illegal immigration was a powerful political issue in the economic downturn of the early 1990s, and the initiative's backers hope it will be again. Hilton said the group is enlisting an "enormous volunteer base" for the signature gathering. His organization, Taxpayer Revolution, has gathered endorsements from elected officials, including Rep. Dana Rohrabacher (R-Huntington Beach), the American Legion California chapter and immigration restrictionist groups such as NumbersUSA, Save Our State and Coe's California Coalition for Immigration Reform. The drive coincides with decisions in several states -- including Oklahoma, Colorado Virginia, Arizona and Georgia -- to curtail medical care, mortgage loans, homeless shelter relief and other benefits for illegal immigrants amid the national economic downturn. Officials estimate that California's 2.7 million illegal residents account for $4 billion to $6 billion of the state's roughly $105-billion budget. Most of those costs are associated with schools, prisons and emergency healthcare. "Are we going to continue asking taxpayers to pay for these services when the state is completely out of money?" asked Hilton, who first rallied against illegal immigration two decades ago. Most illegal residents contribute to the state through taxes and labor, but research indicates that the costs to state and local governments outweigh the additional tax revenue, at least in the short term. The nonpartisan state legislative analyst's office says the measure could reduce costs by more than $1 billion a year if it survives legal challenges. Peter Schey, a Los Angeles attorney who successfully challenged Proposition 187, said courts would almost certainly strike down the measure. "This proposal . . . has no chance of surviving a constitutional challenge," he said. "It is plainly driven by racism and a desire to whip up xenophobia during difficult economic times for U.S. citizens." Backers say, however, that they have carefully crafted the measure to avoid the legal pitfalls that doomed Proposition 187, which would have barred illegal immigrants from receiving any public social services, education and nonemergency medical care. Voters approved it, 59% to 41%, but a federal judge ruled that the measure unconstitutionally usurped federal jurisdiction over immigration. This time, backers worked with attorneys who have helped craft successful efforts to curtail benefits in other states. The new measure does not claim any state authority to regulate immigration, said Mike Hethmon, an attorney with the Washington-based Immigration Reform Law Institute who advised the initiative's authors. Instead, he said, it is based on federal authority delegated to the states to restrict access to benefits and verify applicants' eligibility. Under the 1996 federal welfare reform law, illegal residents are barred from welfare, public housing, food assistance, unemployment aid and other federal benefits. California laws, however, allow illegal residents to receive some state and local benefits, including nonemergency medical care. The initiative would require all applicants for public benefits to verify their legal status. And unlike Proposition 187, it would not attempt to curtail access to education. The Supreme Court ruled in 1982 that states could not bar illegal immigrant children from schools. The measure's most controversial provisions would take aim at the U.S.-born children of illegal immigrants. It would end state welfare to an estimated 48,000 households and 100,000 children, aid that now costs the state $640 million a year. Currently, children of illegal immigrants can receive CalWorks benefits if their parents are poor enough to qualify for welfare. About 42% of child only" cases in the CalWorks program involve illegal-immigrant parents, state officials say. The measure would also cut off CalWorks payments to the children of citizens or legal residents who fail to meet eligibility requirements for state aid because they are unwilling to work, addicted to drugs or absent, among other reasons. The initiative would require that applicants for birth certificates verify their legal status. Those who could not would have to present official identification from a foreign government, a record of any publicly funded costs for delivering the child and other information before receiving their child's birth certificate, which would be marked with the notation "foreign parent." The records would be sent to Homeland Security officials. Kristina Campbell, an attorney with the Mexican American Legal Defense & Education Fund in Los Angeles, said that provision is legally vulnerable. "You can't deny a U.S. citizen child a birth certificate," she said. "They are entitled to equal protection of the law." The views were different at Camp Vigilance, where many of the 300 people gathered for a Fourth of July program on illegal immigration flocked to sign the petition. "Coming here in violation of our laws is an act of disrespect," said Tony Dolz, a native Cuban and campaign volunteer. "Those who break our laws should not benefit from it." How will Texas compete in Race to the Top? How Should We Teach English-Language Learners?